When you’re expecting your first child, those nine months are full of firsts. From feeling the flutter of little, growing legs inside your tummy to not being able to button your jeans, it’s an experience unlike any other. The same goes for those newborn days, when every laugh, cry, smile and movement is fascinating (and sure, exhausting). While there are many beautiful memories during these early stages of parenthood that you’ll cherish, there are some that you’ll probably wish you could skip right over. Due to shifting hormones, normal weight gain and breastfeeding, there are several skin issues that are far from comfortable when you’re pregnant or a new mom. Though all treatable, some of these blunders (looking at you, stretch marks) may be a tad more long-lasting. On average, doctors recommend women gain between 25 and 35 pounds when they’re pregnant. Much of these weight goes directly to your stomach or your breast, sometimes resulting in red or purple stretch marks. While many products might claim to help you prevent stretch marks, Dermatologist Dr. Arash Akhavan, MD, FAAD says the only guaranteed way to lower your risk of stretch marks is based on genetics. However, dermatologist Dr. Stanley Kovak notes that specific ingredients found in lotions and oils can be beneficial. When shopping, check the back label for “alpha-hydroxy acid” since this may help minimize their appearance. Another way to keep stretch marks from rearing its head? “Believe it or not, exercise can help diminish or prevent stretch marks,” explains Dr. Kovak. Thanks to frequent movement, your skin may battle against these marks since it will be stronger and more conditioned. 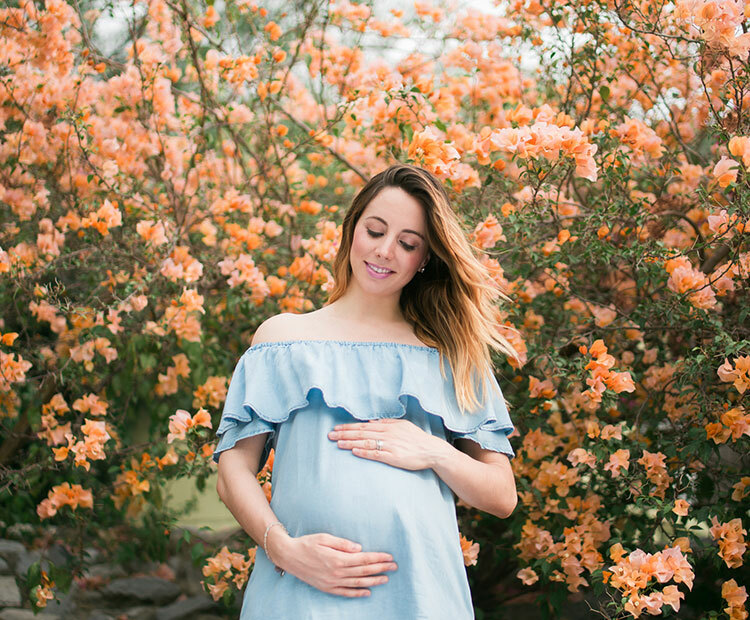 Post-pregnancy, Dr. Akhavan adds you can also invest in non-invasive, effective and safe skin-resurfacing lasers that can make significant improvements to bothersome stretch marks you earned from pregnancy. A distressing and somewhat scary side-effect of pregnancy for some women is melasma, a skin hyperpigmentation condition. While it can happen anywhere in your body, Dr. Kovak explains it traditionally appears on the cheeks, forehead and upper lip, forming red, blotchy patches. He explains this issue is often referred to as “the marks of pregnancy” and is sometimes heightened by sun exposure. Just like any other time in your life, it’s super important to wear a gentle, broad-spectrum sunscreen to protect not only your own health, but that of your growing babe’s too. The good news about melasma is that it usually clears up after you give birth, and if not, can be solved with a laser treatment post-nursing. Dr. Akhavan explains that thanks to a fluctuation in hormone levels (hello, mood swings! ), many women struggle with breakouts throughout their pregnancy. Though normal, the bad news is that many traditional treatments for acne are off-limits when you’re carrying a baby. “It’s important to avoid certain acne medications, even over-the-counter ones, that can potentially have harmful ingredients for the fetus. Always check with a dermatologist or your obstetrician to be sure the acne products you are using are safe,” he notes. This is when paying attention to ingredients is important, as Dr. Kovak notes cleansers with alpha-hydroxy acid may help reduce unwelcome zits. Congrats! You had your beautiful baby and six months later, he or she is finally sleeping through the night. You’ve lost almost all of the baby weight and you’re getting into the groove of being a mom, with one annoying catch: the loose skin around your belly just won’t tighten. “Women complain about the loose skin throughout their body after pregnancy, particularly on the breasts, abdomen, thighs and arms. Rising levels of estrogen can loosen collagen within the dermis, leaving the skin looser after childbirth and breastfeeding,” explains plastic surgeon Dr. Raffy Karamanoukian MD FACS. Once you’ve had your last child, Dr. Karamanoukian suggests radiofrequency treatments to tighten the affected areas, which he notes is a popular trend for moms. “The treatment of loose skin around the breasts and abdomen are among the most popular post-pregnancy cosmetic treatments. In fact, tissue tightening is quickly outpacing plastic surgery as a first-line mommy makeover treatment after pregnancy,” he explains. At home, try applying firming creams, or lotions designed to boost circulation and tone your skin, to help make your skin appear tighter and smoother. Though when you were taking prenatal vitamins, you may have adored your strong, silky locks and fast-growing nails, once you jump for joy over those two blue lines, your manicure might take a hit. Dr. Kovak explains many women experience nails that split or become rough when they’re expecting. He says maintaining your nail care during pregnancy is key, especially since doctors give the seal of baby-safe approval for nail polish. While you might be frustrated with your fingers throughout those nine months, he notes that most of the time, your nails will more than likely return to normal post-delivery.